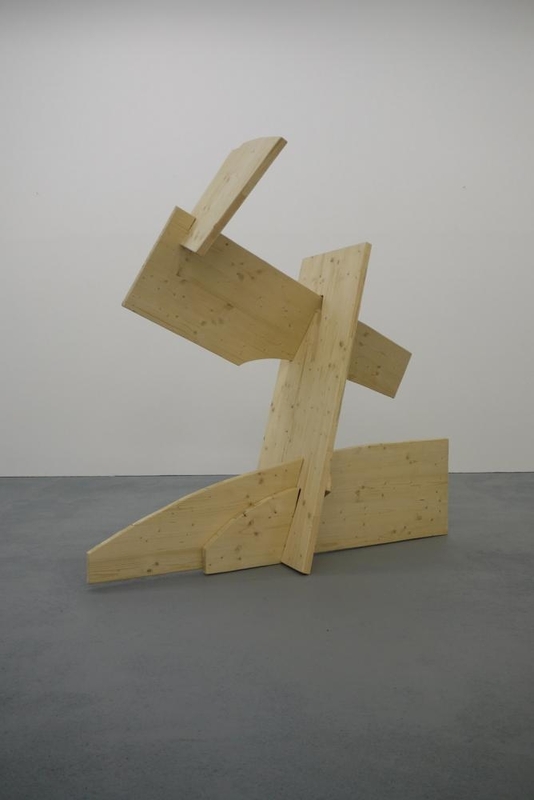 The work of Herbert Eugen Wiegand is characterized by sculptures acting like signs in space and prints conveying sculptural physics characterize, in mutual dependence. Coming from a figurative tradition, the sculptor localizes his works between the dimensions of space and the archaic structures of paper. Sculptures and objects also, and often in temporal proximity, find correspondence in graphic prints, to which Herbert Eugen Wiegand accords equal artistic significance. His preferred techniques are woodcuts and linoleum cuts, both of which demand a rational pictorial design. Linoleum cuts allow him a freer, more abstract treatment than woodcuts do. Here is a kind of bonding with the material that offers scope for pictorial explorations and at the same time permits a minimalistic approach to depiction. Frequently, the printing blocks Herbert Eugen Wiegand uses in woodcuts are elements previously used in sculptures that take on a new level of visibility through the two-dimensional imprint. A direct dialog with the sculpture thereby develops, in whose space-oriented perception are found complex images inherent in the woodcut’s superimposed imprinting. The graphic works usually have a serial character. Clearly delineated reproductions and signs reminiscent of pictograms are thereby used fragmentarily and in excerpts. The artist’s attempt to make spatiality and temporality visible in examples succeeds as a sequence of mutually related pictures of often processual actions. Leibnitz’s theories of space and time find a correspondence in the two-dimensional level of paper. Space, as a site of the “coexistence and juxtaposition of things”, is related to time as the “subsequence and succession of things”. The exclusively spatial perceptual level of the sculptural objects is overcome by consciously making the order of space and time visible. The arrayings, layerings, transformations, and variations arising in printing form a space-time continuum; this means that they are dialectically interconnected in their spatial and temporal dimensions. The methodical treatment of the graphic material exhibits close kinship with cinematic structures. The pictorial language is seemingly translated into motion and can be read as a scenic arrangement of shots or episodic sequences paraphrasing a frame tale. Following Tarkowsky’s statement that defines film as “sculpture made of time”, it seems to suggest itself that the sculptor grasps the cinematic unfolding of pictorial concepts as a logical consequence in the results of his versions of objects and his print series. A specific idea, a conceived design can require a special material for its implementation. The sculptor Herbert Eugen Wiegand has a certain preference, an almost familial connection with the material wood. Found objects and memorabilia like planks, boards, and laths that bear visible traces of everyday use provide a stock of materials with which the sculptor has worked for decades. While the wood itself seldom experiences any far-reaching physical processing, the sculptor concentrates on the surfaces. Pieces of wood are sawn out, broken, layered, dovetailed, or abutted and given color. The way they are reordered conveys a balance of lightness and heaviness, density and delicacy in equal parts. Found objects form mobile depots of ever-new mimetic, narrative, and abstract versions of objects. In the manner of collages, the artist experiments with fragments of material and ersatz materials that develop their own form of language and direct one’s glance toward the surprising potential of the familiar, toward the magic of material reality. Herbert Eugen Wiegand’s objects are sculptures in the literal as well as the metaphysical sense. They tell a story that permits a staging that can be read in several ways. At the beginning of the 1980s, objects suggesting figures and arranged in groups thereby already dominated the artist’s oeuvre. The way they are arranged makes the stele-like pieces of the ensemble, often arrayed in ranks, seem rhythmical. Individual elements take on an only passive presence in space and, in their perceptual perspective, depend upon a dialogical networking of the object pieces. Objects that have a certain corporeality, but that nonetheless consistently elude a discourse of bodies. Figurative distortion on the one hand and calling up objective associations on the other hand are characteristic elements of the object language recurring in relief-like works. Particularly in the sculpture groups, the individual parts seem destined to interact with each other. One act follows the next; as if dramaturgically, the artist seems to consciously run through all the playful qualities of his individual elements. In accordance with their possibilities, they act as if in a kind of role-play or script or as if following a certain choreography. The content, an inkling of which is provided in a pointed choice of title, is intensified by the kind and degree of active connection between the individual sculptural elements. Common to all the groups is the strong dynamic presence in space. Herbert Eugen Wiegand constantly invents and envisions new ensembles, which are not necessarily conceived and realized as three-dimensional works. The object-like character is also found in the works in which organic found objects (seaweed) or objects intended for everyday use (matches, garden hose) are given a new character through their use of material. With an ironic glance, the artist provides a distorted or alienated view of the practical and traditional connotation. The viewer is offered a new perceptual perspective on the functional interpretation of the materials used, which the artist stages playfully. The “inappropriate” use of materials hides their normal use. The confrontation with this unaccustomed aesthetic imprint thereby creates a challenging level of communication between object, artist, and viewer.